Ok, I admit it: I like meat. I don’t eat it very much. In fact, I eat it pretty infrequently. I rarely purchase it. But I like it. I like the way it tastes. And there are very few photos of piglets that will make me feel guilty about enjoying a slice of bacon. However, what I can’t come to terms with is what happened to the meat before its arrival at my dinner table. It arrives after inhumane mammalian brutality, hundreds (if not thousands) of travel miles, and undocumented harm to food workers. All because I wanted a slice of bacon. I’m reaching a point in my life where I can’t bear to purchase meat that’s been produced in ways I can’t stomach. I mean, my ancestors ate meat- but the meat they ate is not the meat I buy at my local grocery store. 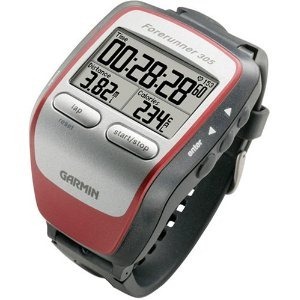 As regular readers of this blog know, I can pontificate on this topic for pages and pages. But all I really need to say is that in order for me to eat meat, I need to be prepared to find meat that was harvested from animals who were raised humanely. Yes, it will be expensive. But that’s the price of being an omnivore in the 21st century first world. 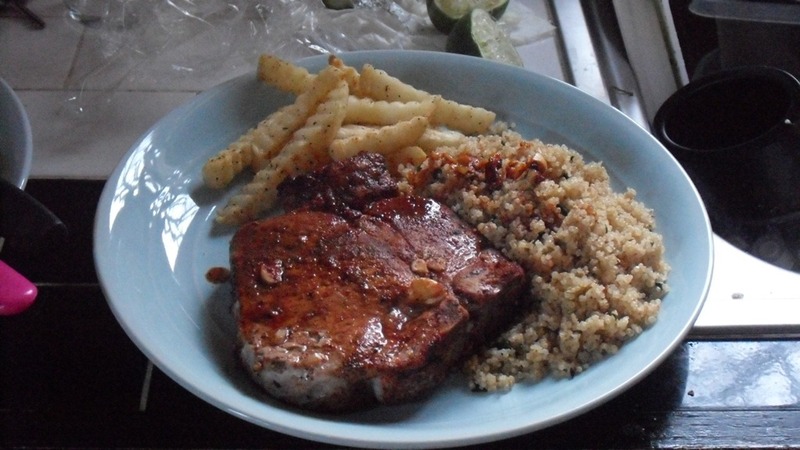 ANYWAY, since yesterday was the most beautiful day ever (seriously, anyone who wasn’t in the North Carolina triad yesterday missed out on a gorgeous Southern spring day), I decided to make my girlfriend a spring-y dinner of pork chops and quinoa. 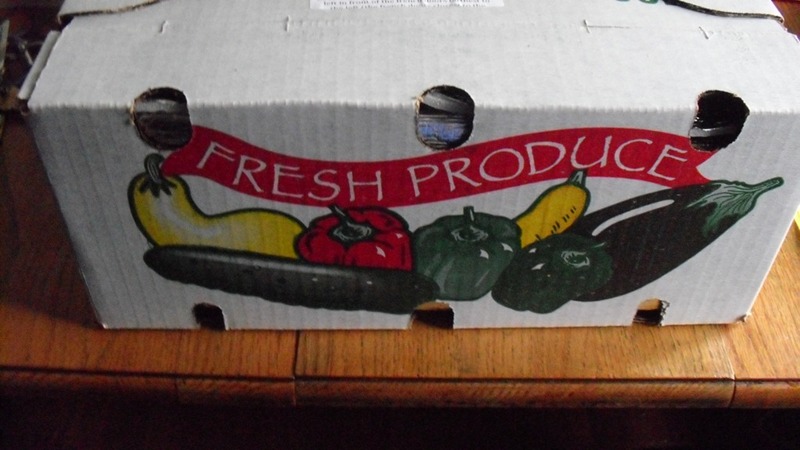 So where does an ecologically conscious Winston-Salem resident go when they want fresh meat? Whole Foods Market, of course. Whole Foods has a remarkable devotion to the sale of sustainably produced food items AND (probably most importantly) to crafting and maintaining solid relationships with farmers and ranchers. Since the food chain from farmer to consumer grows with every congressional bill and ‘science innovation’, it is more important than ever for us to support companies who strive to cut out the millions of middle men who get in the way of Americans eating food which doesn’t go against the evolution of our bodies. As you probably noticed, there’s no step 3 for cattle. There are separate charts for poultry and pigs. 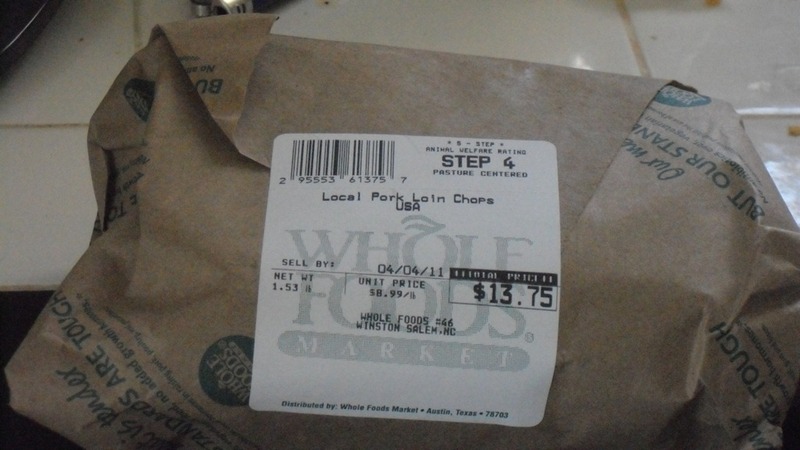 And at Whole Foods, all the meat options are labeled with the number which corresponds to this chart. 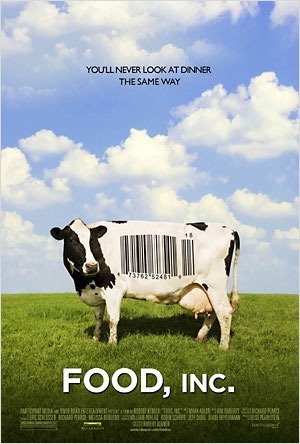 It’s another way of letting you know where your food came from. 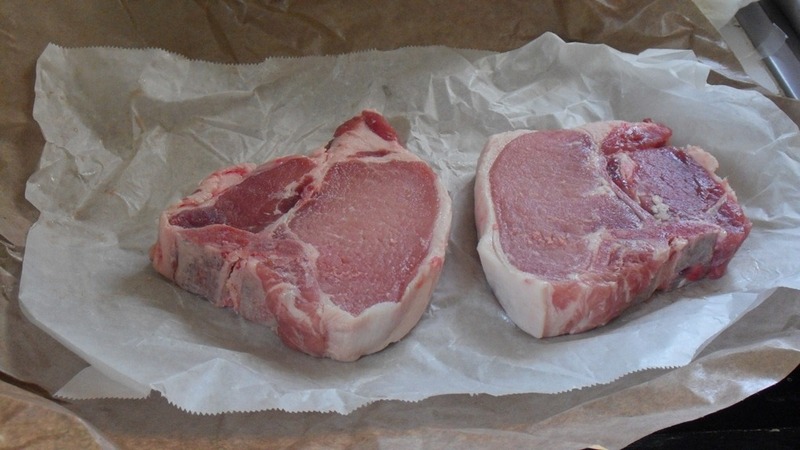 I ended up buying some very pretty chops from a local farm with a 4 rating. There were other options, but the fact that the meat came from a nearby farm means that the journey from farm to table was very short, and it insures the freshest ingredients possible. It does not, however, insure the cheapest price. But here’s the thing- I can’t pretend to not know what I know about factory farming. And if I want to eat meat in spite of that knowledge, I need to be prepared to pay the price. Plus, the flavor of this finished dinner was more than worth the money. 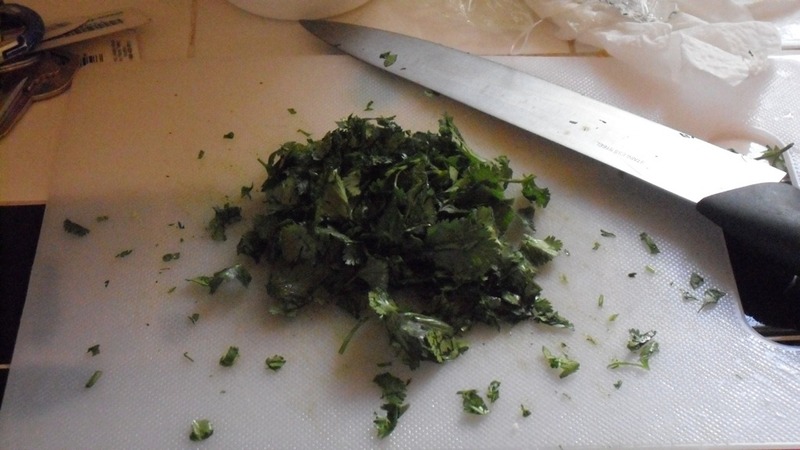 I’m not a huge fan of lime and/or cilantro, but both of those flavors keep popping up in my recipes recently. I’m blaming it on Chipotle– I mean, who doesn’t love their cilantro-lime rice? But instead of making rice, I decided to try out the same flavor combo with quinoa. I’d say it was a success- Kate basically licked her plate clean. Both of these recipes are unbelievably simple, and can be whipped up very quickly. They can be served together, or paired with other dishes. For example, substituting cilanto-lime quinoa in a homemade Chipotle burrito bowl is a healthier option than eating mounds of fluffy white rice. 1. Trim off extra pork fat. 2. 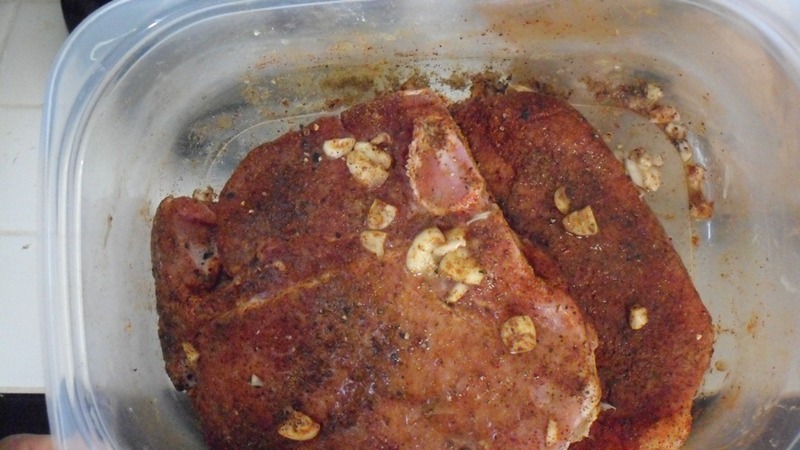 In a large bowl season pork with garlic, cumin, chili powder, paprika, salt and pepper. Squeeze lime juice and some zest from the lime and let it marinade at least 20 minutes. I always recommend long marinade times, but if you need to make this in a hurry, 20 minutes should get the job done. I had to whip up this meal pretty quickly, and I think 20 minutes was long enough to get a good flavor infusion. 3. 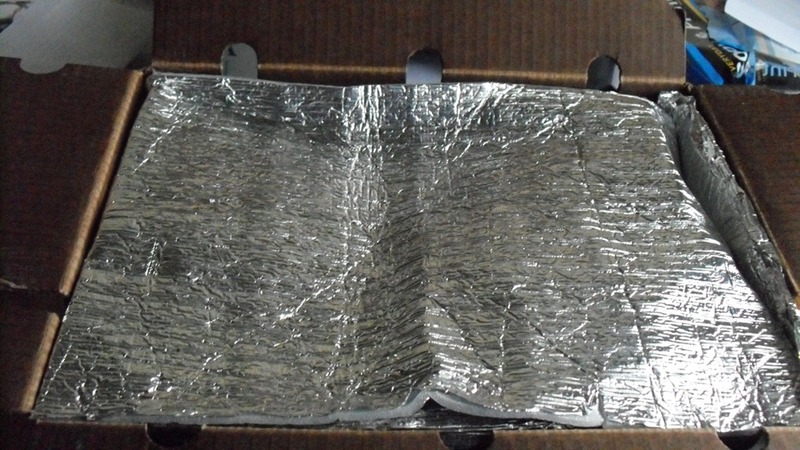 Line broiler pan with foil for easy clean up. 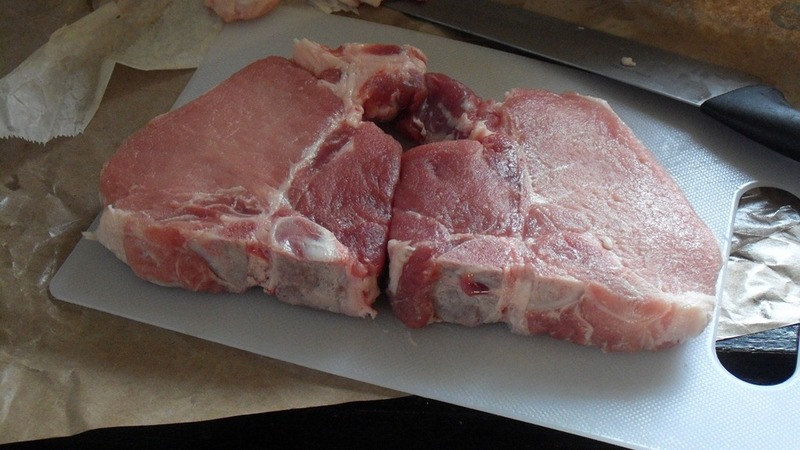 Place pork chops on the broiler pan and broil about 4-6 minutes on each side or until nicely browned. 1. 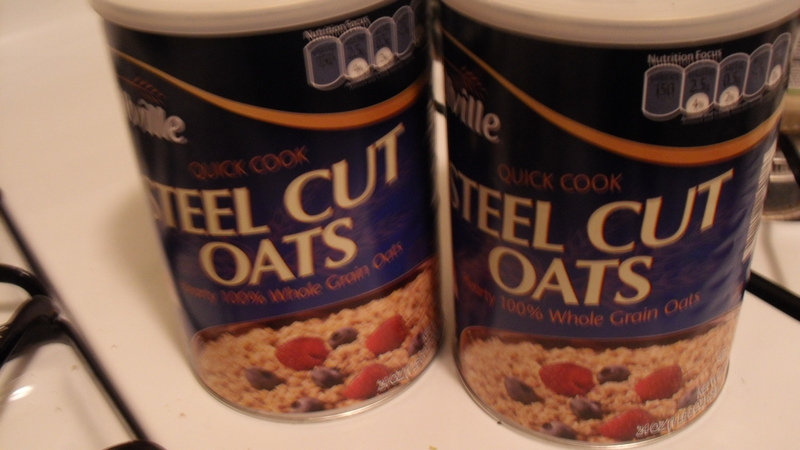 Follow my instructions for fool-proof quinoa. 2. While quinoa is cooking, combine chopped cilantro, lime juice, and remaining oil in a medium bowl and toss until completely mixed. When quinoa is finished cooking, add it to cilantro-lime mixture and toss until coated. Yes, your eyes are not deceiving you: Kate and I also ate French fries with our dinner. But those French fries are extra special, and will be reviewed in a separate post. However, just for the record, they were absolutely delicious. 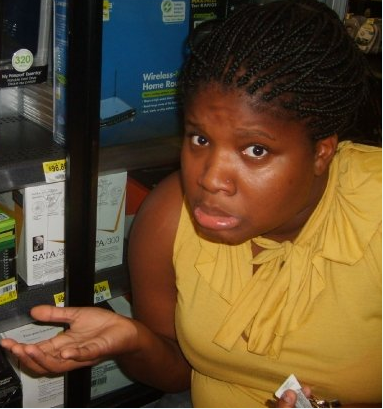 I actually wrote this entry several months ago when I was writing under another blogging alias, The Frugal Student. However, I recently found the entry, remembered what a RIDICULOUS cooking experience this was, and decided to share it with all of you. I wrote this entry write after my undergrad graduation (about eight months ago), and I was cooking in my old apartment kitchen- which just makes me appreciate my new giant kitchen. Seriously, my new kitchen is a palace compared to the shoebox I cooked in for a year. So in the weeks since graduation, I’ve been indulging in some of the finer things in life. Basically, I’ve been doing a lot of sleeping and eating. Mostly sleeping. But I’ve also been doing a fair amount of culinary exploration. 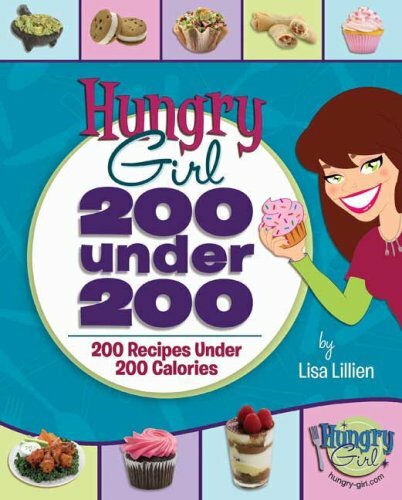 Which brings me to my next point: Have you met the Hungry Girl? Ok, before I go any further, let me just say that anyone who knows me is well aware that I am the modern definition of a book worm. I actually collect copies of “The Joy Of Cooking”, and have a fiction collection which requires the purchase of a new bookshelf. However, while I absolutely adore large, franchise bookstores like Borders and Barnes and Noble (c‘mon, who doesn‘t love sipping overpriced coffee while looking at wall-sized imaginings of Oscar Wilde? ), I would not recommend that the average broke student/person patronize stores like this when money is tight and there are so many other options available for the purchase of books. For example, your local used bookstore is the best source for new books and, depending on the store, movies and music as well. I mean, think about it: why buy a new copy of a book when you can just wait for someone else to read it, and buy their gently used copy? Used bookstores are basically the ‘middle man’ version of putting up posters around town saying, “Hey! I read this book and don’t need it anymore. 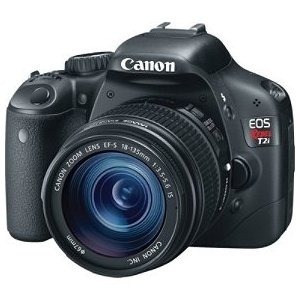 Do you want it?” For example, I got my barely used copy of “200 Under 200” for the bargain price of 8.00, including tax. Now let’s say I couldn’t find a copy of “200 Under 200” that day, and/or I didn’t live in an area with a rockin’ used bookstore. This a time for the wonderful world wide web, specifically half.com or Paperback Swap. These are basically the internet examples of getting used books on the cheap. Paperback swap is especially awesome, as you gain credit by trading your own books. Wow. Even for me, that was a pretty ridiculous tangent. 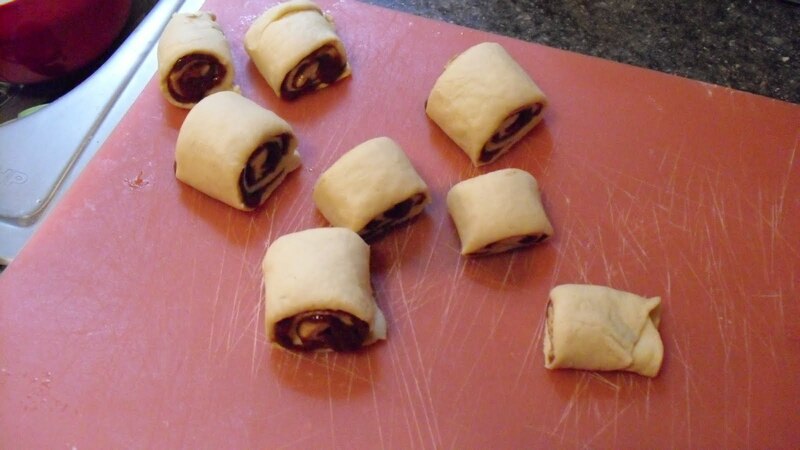 Anyway, back to the Hungry Girl: so a few days ago I decided to try out her recipe for cinnamon rolls. Now, I don’t have much of a sweet tooth but every once in awhile I enjoy a bite of something very sugary. The Hungry Girl swears by a number of products I don’t typically use, but I decided to stretch my mind so I could try this recipe while maintaining some of its integrity. 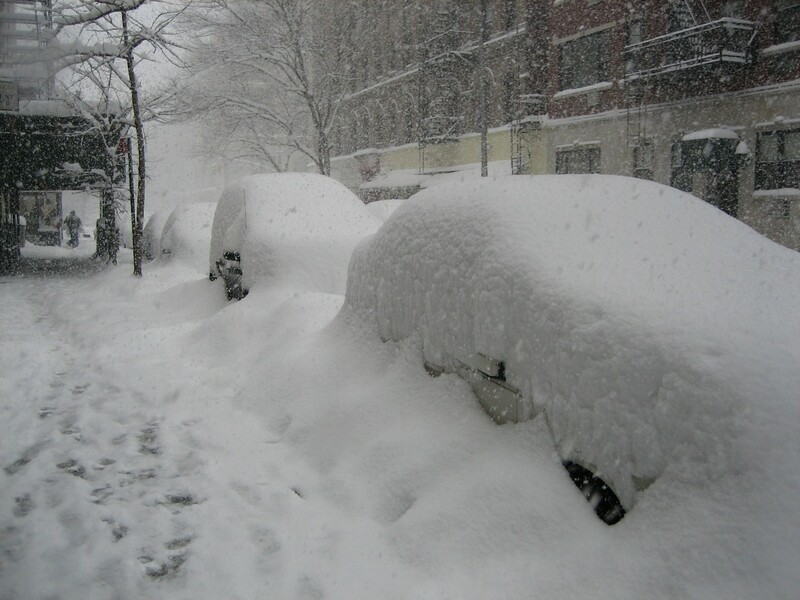 But of course, because I’m The Frugal Student, I did make a few adjustments. *Um, we’ll revist this topic later in the recipe review. Yes, I included this step because this is something I tend to forget about until I’m ready to start baking. 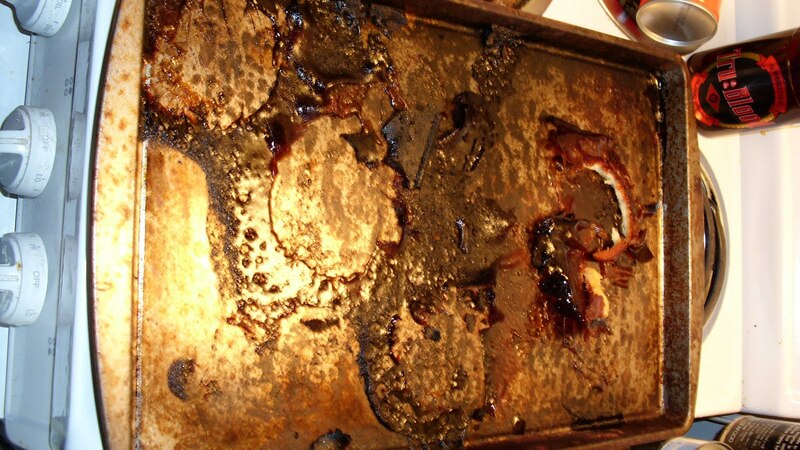 Anyway, preheat your fracking oven. Now, in my opinion, I have a very well stocked kitchen and “pantry” (the term pantry is being used loosely to define the singular cabinet into which my roommate and I cram all of our dry ingredients.) I have multiple forms of sugar, but guess what I don’t have? Dark brown sugar. However, I do have light brown sugar. Which, of course, is hard as a rock because it’s been sitting in the back of a cabinet for several months. Hm. What to do? Well, I’ve actually read extensively about salvaging crunchy brown sugar from a life of crystallized rock-hood, and after a bit of reconstructive work (hyperlink), I brought my bag of sugar back from the dead and was able to use it in this recipe. The result? Um, I’m not a pastry chef or any sort of food scientist, but I am of the personal opinion that there’s a distinct reason why recipes call for a specific type of ingredient. 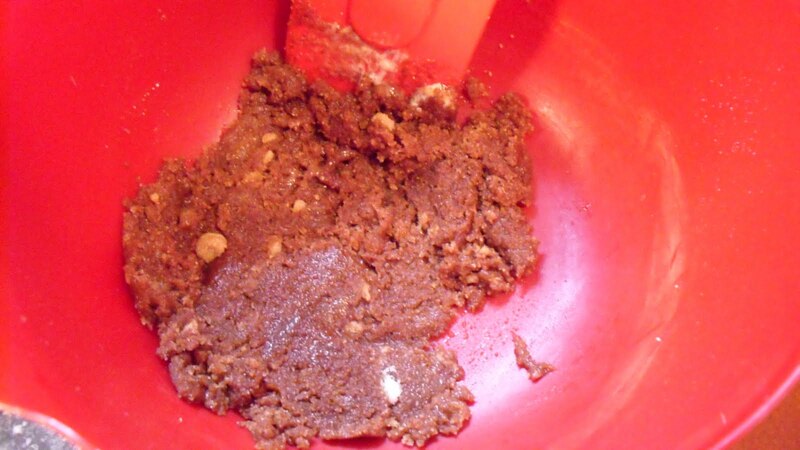 In fact, this is not the same as substituting store brand ranch for Hidden Valley- ultimately, light and dark brown sugar are molecularly different and can’t be used interchangeably. I’m not saying this caused a huge problem, but in the future I will definitely be using the correct type of brown sugar. However, my filling did eventually come together, in spite of my haphazard ingredient renovations. Time for the second screw-up- No, the problem wasn’t the Harris Teeter fat-free whipped topping I used (which, in my opinion, is just as good as Cool Whip brand.) It was the DEFINITELY NOT room temperature cream cheese I attempted to beat with it. 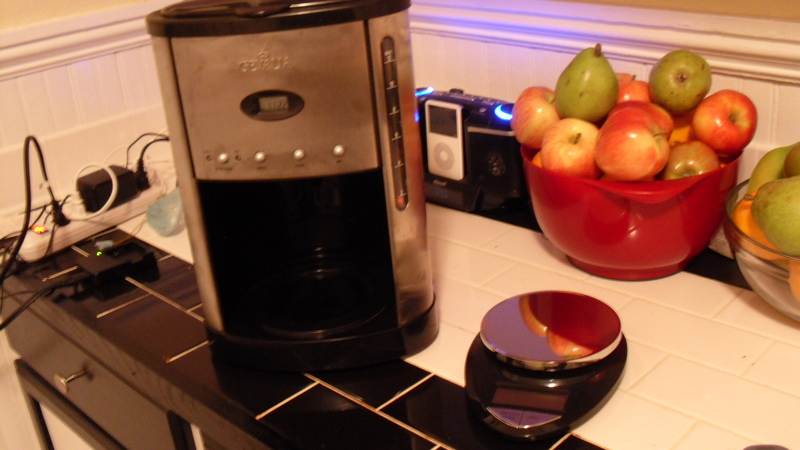 If a recipe calls for something to be room temperature, take it out of the fridge more than five minutes before you need it. 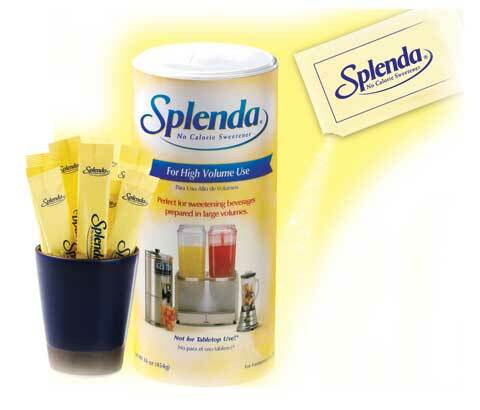 Also, again, agave nectar is not the same as splenda. Texture is more important than I can say. 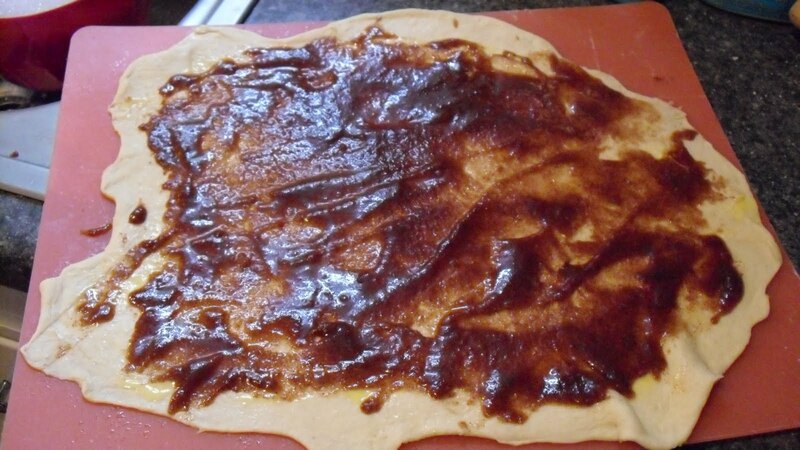 Now, after my very interesting experience with the filling, I knew I couldn’t get away with the agave method again. 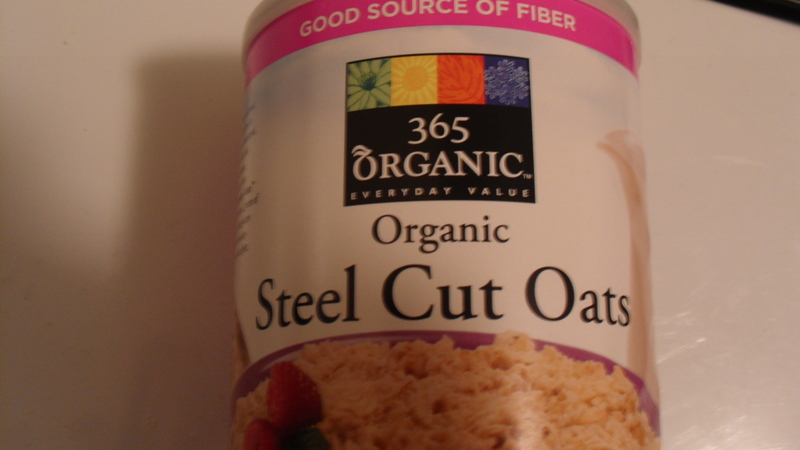 So instead I decided to use ½ tablespoon regular sugar combined with ½ tablespoon agave nectar. First of all, the addition of agave nectar and regular sugar dramatically alters the caloric intake of this recipe. But also, the texture of the icing was slightly off. Not really ‘bad’, but definitely different. This went smoothly enough. 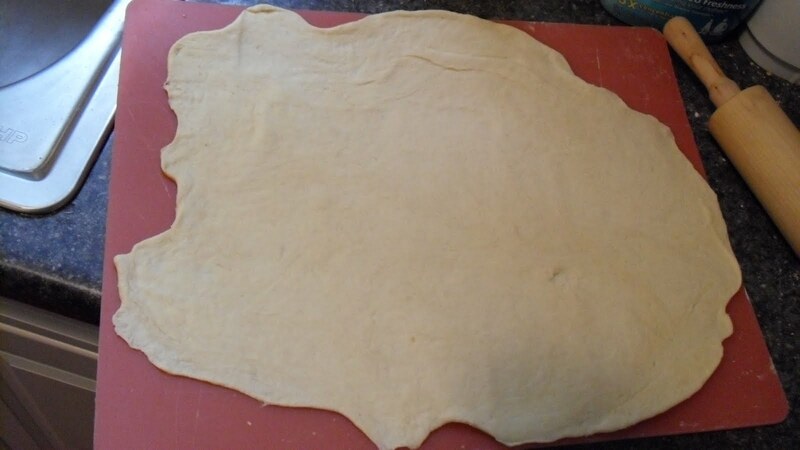 Since our kitchen space is about 5’x3’ (I wish I were kidding), there’s not nearly enough counter space for me to roll out dough without risking the dough touching other non-dough items. Therefore, I always use these awesome, super cheap cutting boards from ikea as a rolling surface. 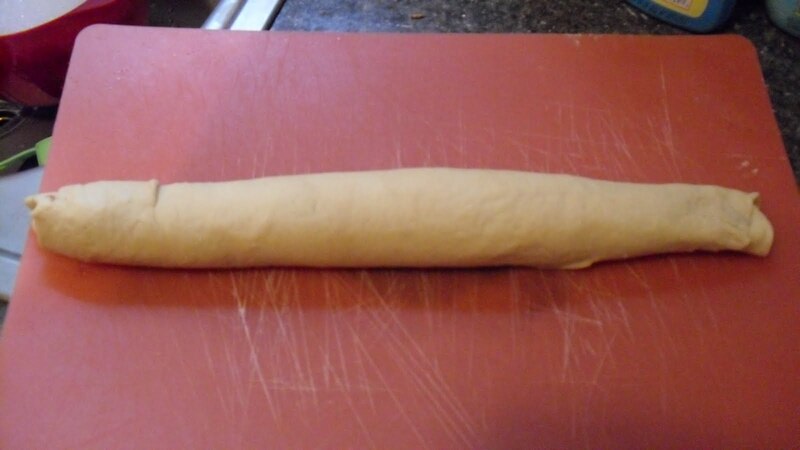 Oh, and my rolling pin? 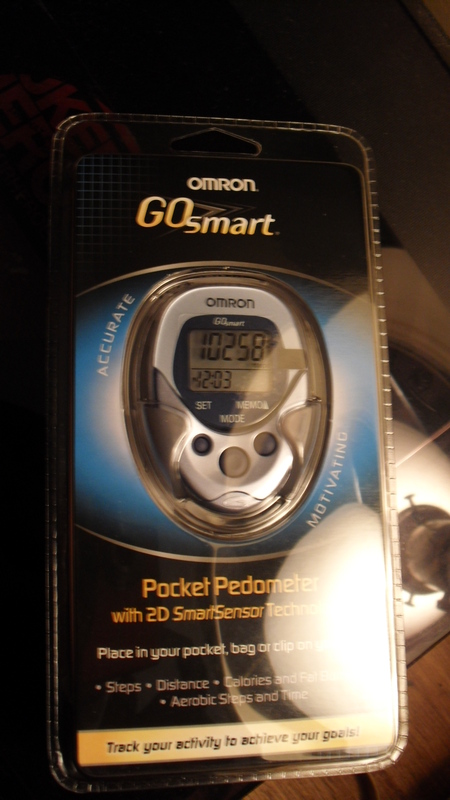 Definitely came from target, at the price of $2.50. I’ve had it for quite some time, but before that I’m not ashamed to admit I swore by the canned food rolling pin. 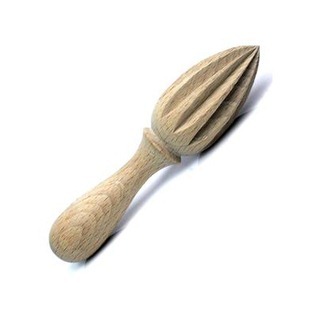 I have to say, though, an actual rolling pin is a serious upgrade. Also, I used Parkay spray instead of I Can’t Believe It’s Not Butter! and couldn’t tell a definite difference. So do these look a little extra gooey to you, like maybe the filling is oozing out of the top a little too enthusiastically? Uh, yeah. 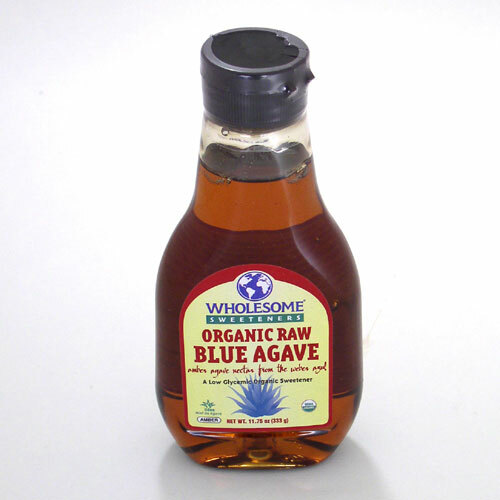 Once again: don’t use agave nectar AT ALL. 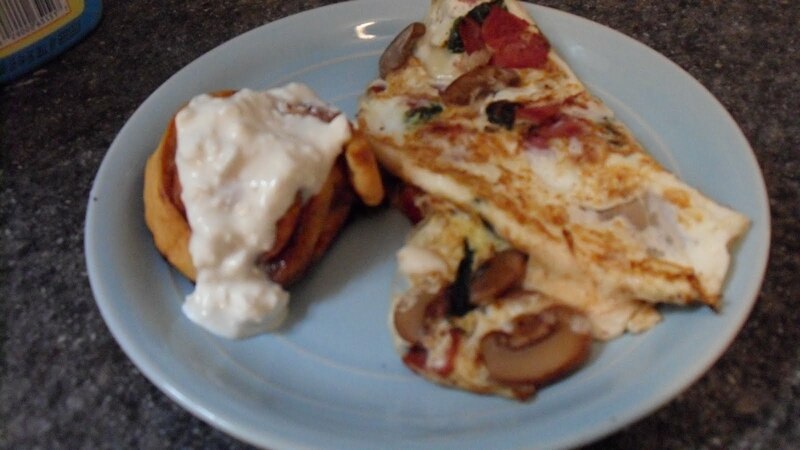 During step nine I whipped up an easy egg white omelette to enjoy with my cinnamon roll. 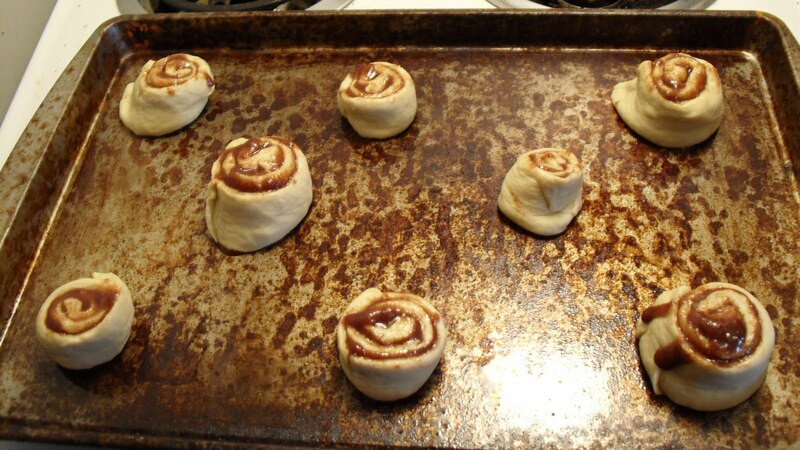 I don’t know if you can tell, but the pan is absolutely coated in cinnamon roll filling which oozed from the rolls into a hardened glaze on the baking sheet. Damnit. Damn, Damn, Damn. I bet the Hungry Girl doesn’t have to put up with s*** like this. 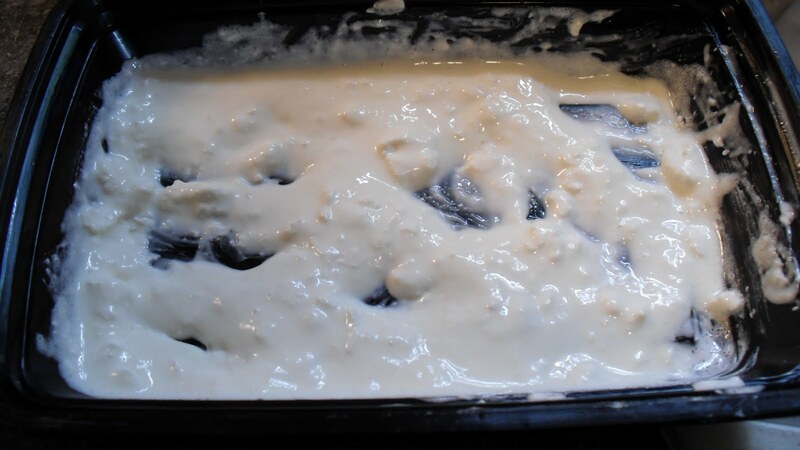 As I mentioned earlier, Greek yogurt is one of my great loves- it’s thick, creamy, low fat (depending upon the brand), and an excellent addition to a multitude of dishes. 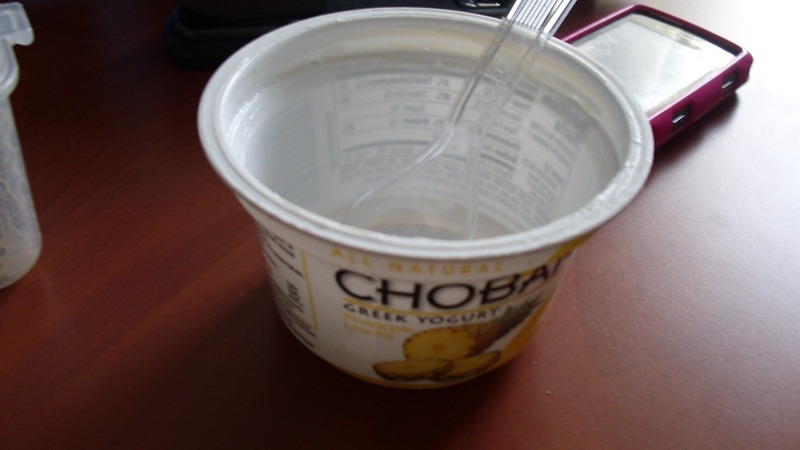 That being said, can you BELIEVE today was the first day I ever tried Chobani Yogurt? In my defense, I’ve always been hesitant to buy Chobani because, for a broke grad student, it’s pretty pricey. 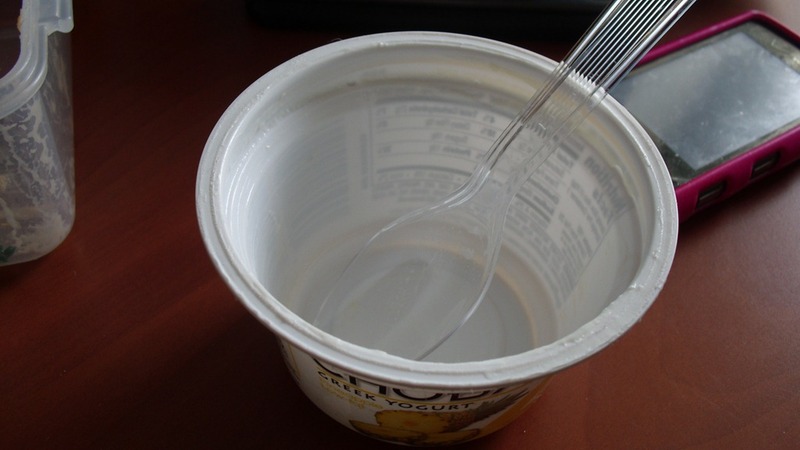 However, due in no small part to my new food resolution, I decided that the time had finally come for me to try out one of the most talked about Greek yogurts in the blogosphere. I’ve got to say: this was true love at first Bite. Chobani is everything I dreamed (and read) it would be. It’s super smooth and creamy, with delicious nuggets of pineapple just waiting to be scooped into your mouth. 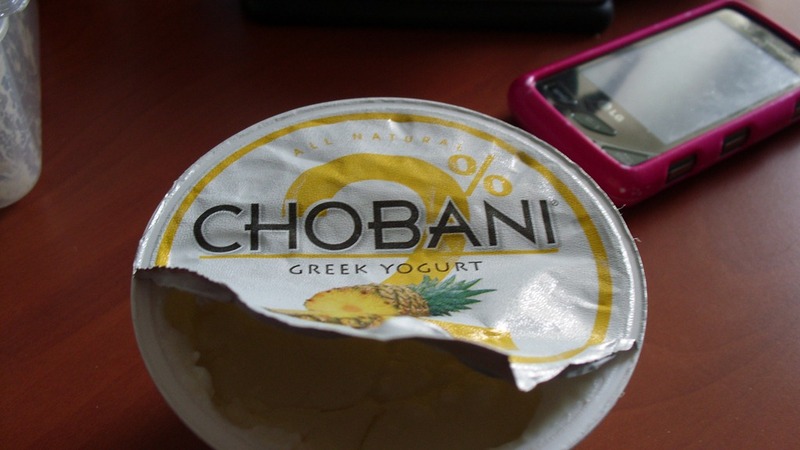 Unlike other fruit on the bottom yogurts, Chobani doesn’t have a weird syrupy fruit base. It tastes like…well, like fresh pineapple added to a creamy treat. So delicious, I basically had to lick the container clean. 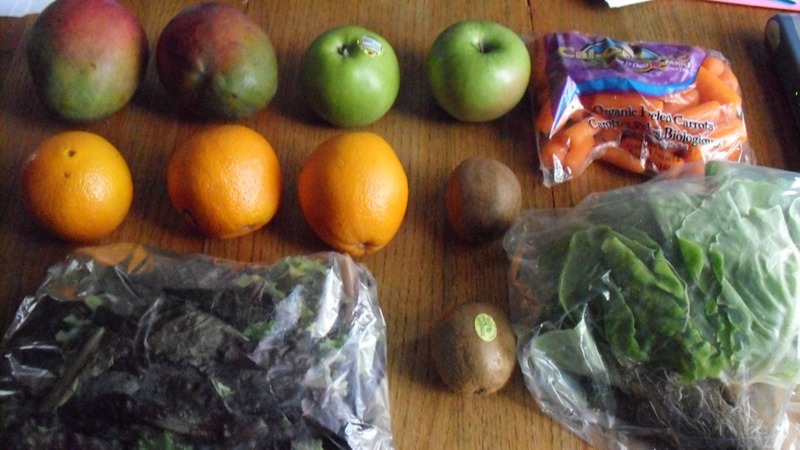 At 4 wwpoints+, it is a great mid day snack or an addition to a green smoothie. I don’t typically put dairy items in my Green monsters, but I bet Chobani would taste delicious. 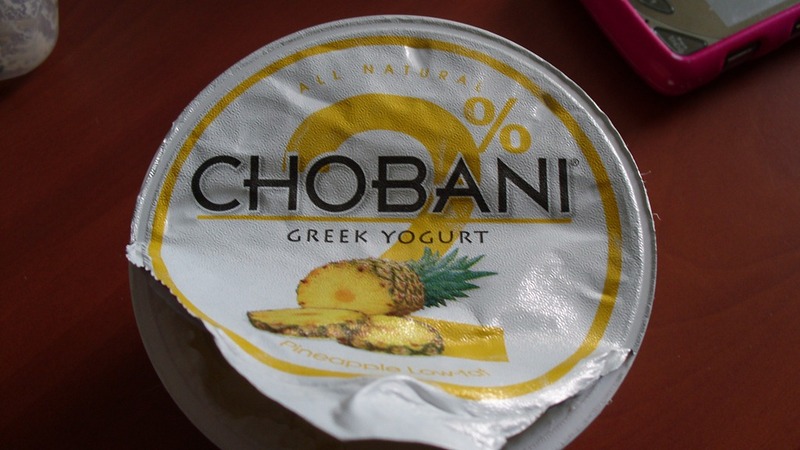 Chobani comes in a number of flavors, so I also picked out mango and honey. If those flavors taste anything like the pineapple version, I will have truly fallen in love. I also finally tried Flatout Flatbread. 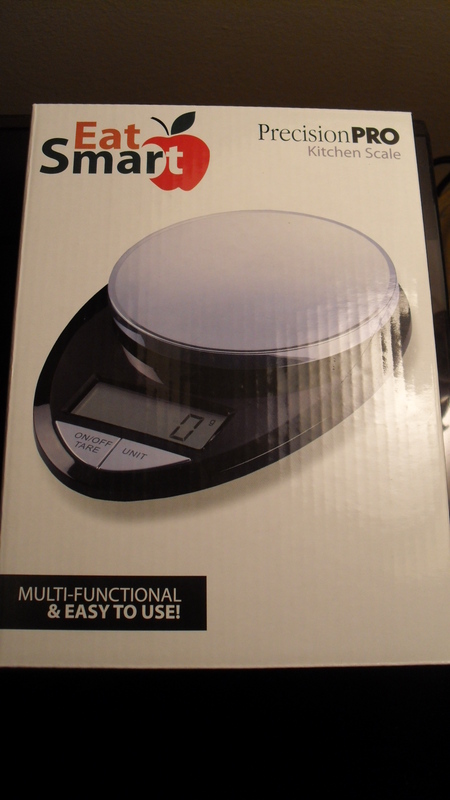 I had two reasons for not trying Flatout wraps- first of all (of course), I thought they were slightly overpriced. That problem was solved because they are on sale at Harris Teeter this week. 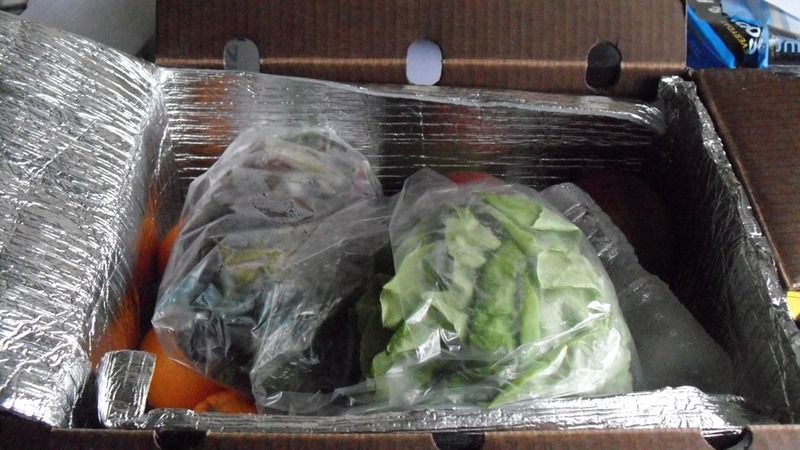 Second problem is that I have had some bad ‘wrap’ experiences. In my opinion, wraps are either really delicious and perfect, or dry and flavorless. 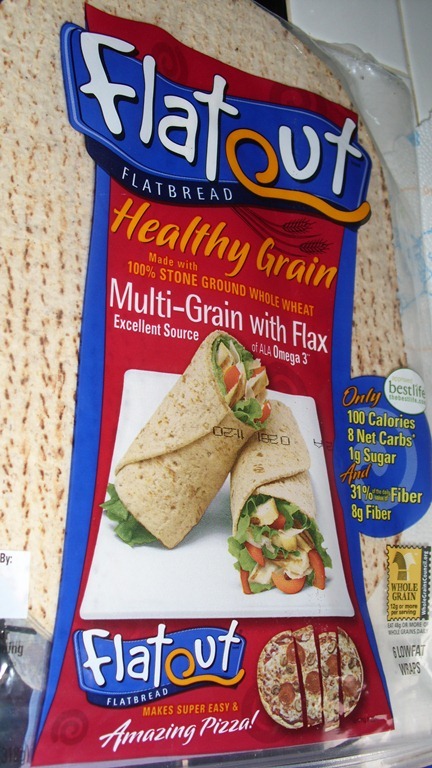 I am happy to say that I was way too quick to judge Flatout Wraps- I bought the Multi-grain with Flax, and they are absolutely delicious. The texture of the wrap is surprisingly moist, especially considering that they are sold in the bread section and not the freezer section. They are nice and floppy, so they don’t twist, break, or crack when you wrap them in whatever filling you choose. Speaking of which, I decided today was a perfect day to make a tuna wrap. 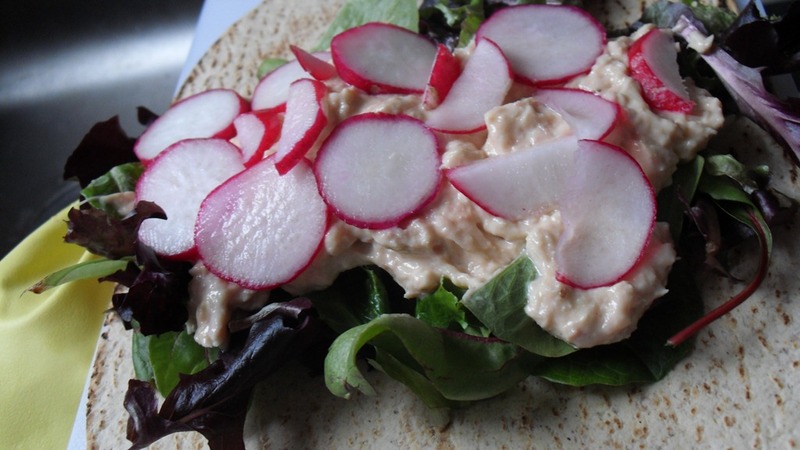 What are the secrets to Jessamyn’s Tuna Wrap? 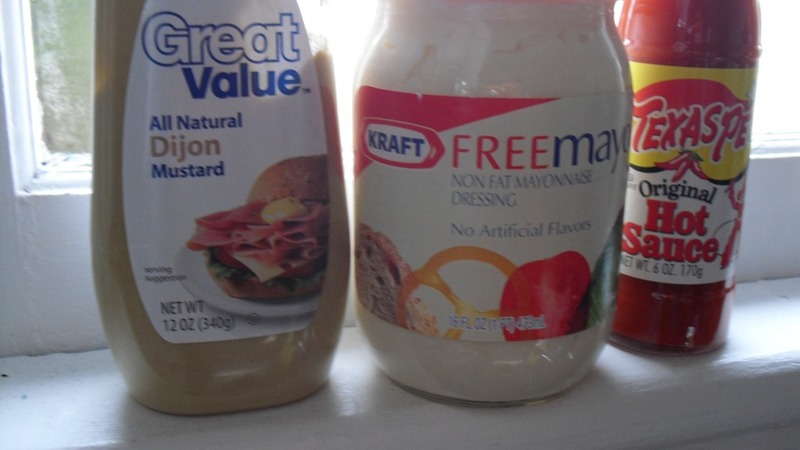 a) fat-free mayo tastes awful. 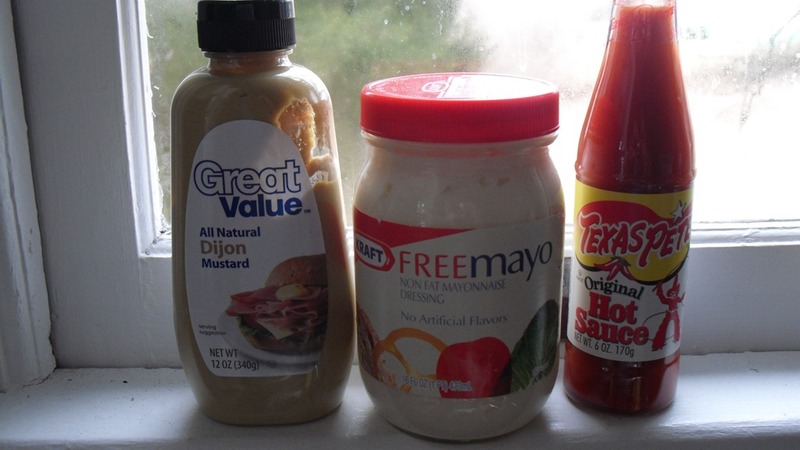 b) the ingredients are worse than regular mayo ingredients. 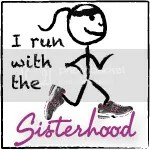 Plus, I’m a Southern Girl- I should know not to buy anything other than Duke’s Mayonnaise. Speaking of Official Condiments of Southeastern USA, Texas Pete is a required ingredient in most dishes- when I was high school, we had an (informal) contest to see who could eat the most Texas Pete (FROM PACKETS!) in one sitting. I also really like to add dijon mustard to most things- I definitely prefer to pass the Grey Poupon, but Great Value is no slouch either. 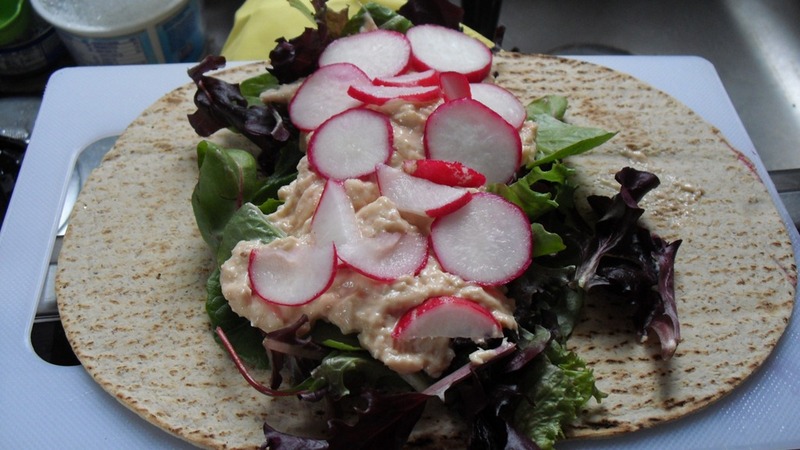 I set the tuna mixture on a bed of greens, and at the last minute I decided to thinly slice a radish on top of my wrap. Radishes have such a delicious crunch and a very refreshing flavor- they taste good with pretty much everything, ESPECIALLY tacos. Verdict? Get thee to your local grocer and buy Flatout wraps and chobani yogurt. DE-licious. I don’t have any major food allergies- I mean, there’s a very great chance that I might have undiagnosed lactose intolerance, but that has yet to stop me from eating cheese like it’s going out of style. And while I don’t have any (known) gluten allergies, reducing the amount of gluten in one’s diet has a number of health benefits, including better digestion. Anyway, when I saw that Udi’s Gluten-Free Sandwich Bread was on sale at Whole Foods, I got really excited to try out this really reputable brand. 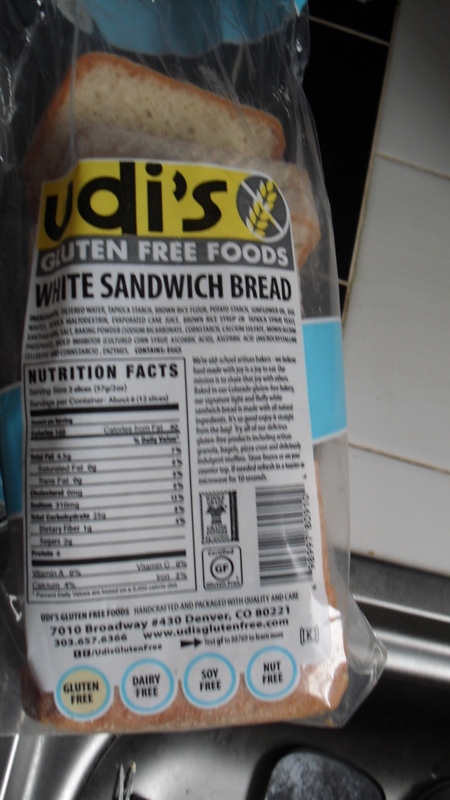 Udi’s started making gluten-free products after their master baker was asked by a friend with celiac disease to come up with a new recipe for gluten-free bread. He ended up developing Udi’s “secret” recipe, and the rest is history. In my opinion, this bread stands above other gluten-free breads I’ve tried. It’s a little mealy, but not too mealy, and it has a delicious bite as well as a really mellow flavor. 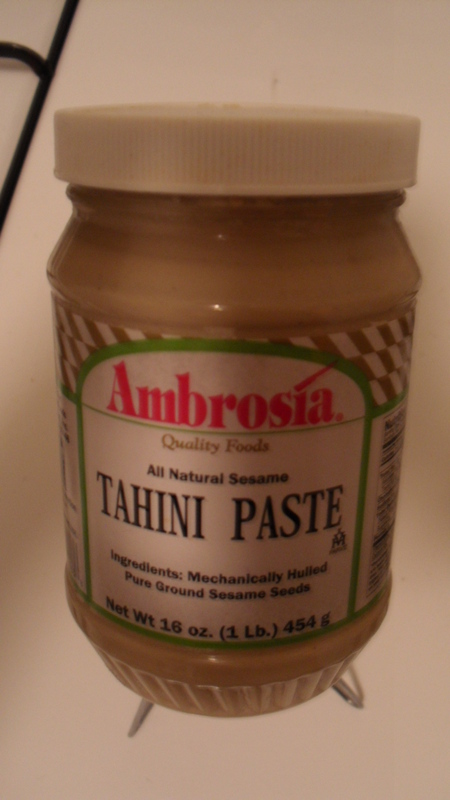 I tried the original recipe, and I think it’s really good for every day sandwiches and toast. 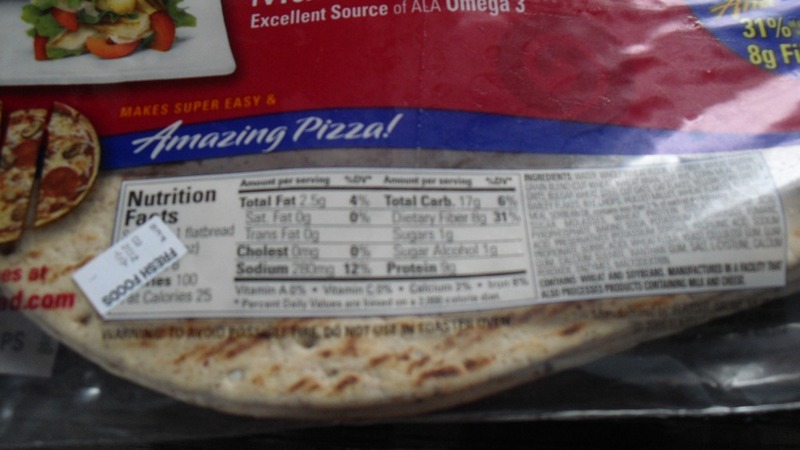 However, be aware that gluten-free does not mean THE HEALTHIEST FOOD IN THE WORLD OMG- I mean, it’s still bread. And the last time I checked, bread is a carbohydrate. 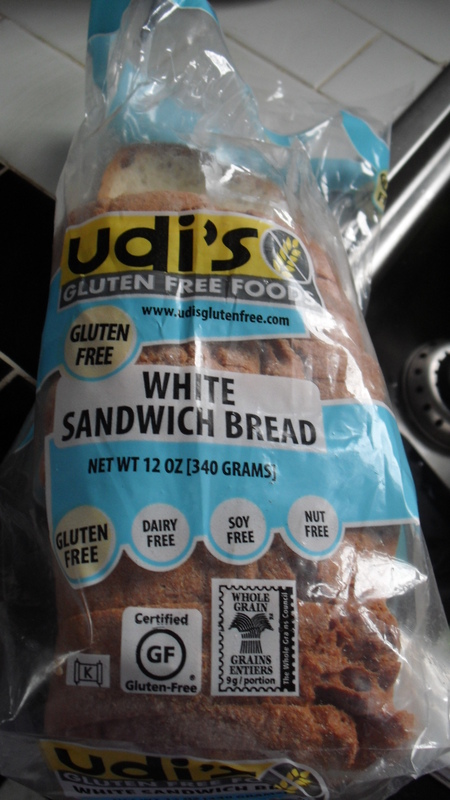 That means two slices of Udi’s Gluten Free White Sandwich Bread is 4 WWpoints+. Basically, as long as you don’t eat the entire loaf in one sitting, I think eating Udi’s bread is perfectly fine for a Weight Watcher. 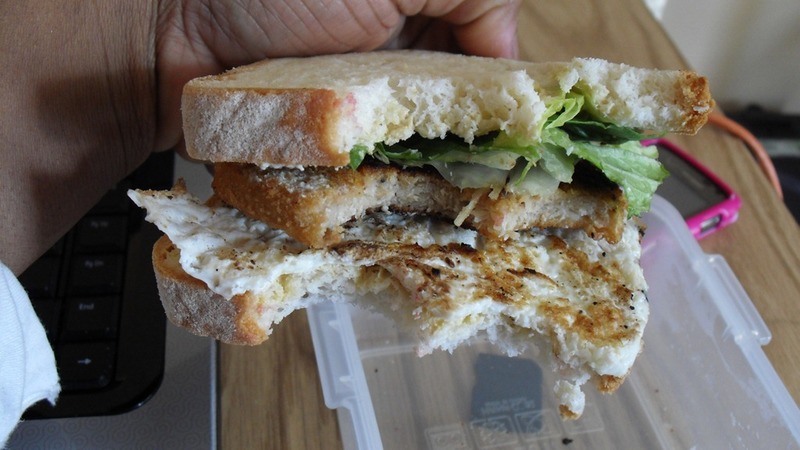 For lunch, I ate my Udi’s in a sandwich made with a Boca Chik’n Patty, lettuce, mustard, and an egg white (look, don’t act surprised- I said I like eggs). The whole thing was 8 WWpoints+. Tonight my brother and I are having our first WW meeting together. Since we’re both doing WW online, we’ve decided to meet up once a week and have our own version of a WW meeting. I think it’ll be a great way for us to spend a little more time together, and support each other. Do you have any unconventional support systems? Also, how do you feel about gluten-free diets?